Hi, My name is Agnesh. I have been teaching English for over 5 years now. Teaching is my passion. I am a TESOL (Teachers of English to Speakers of Other Languages) certificate holder and a TEYL (Teaching English to Young Learners ) certificate holder. I took a bachelor of Secondary Education Major in English and I can teach from zero level learners to advanced level learners. I always give my 100% energy to each of my students, because in return students complete my day whenever I notice them improving. So come on and have a class with me. Teacher Agnesh got a Bachelor of Secondary Education Major in English. 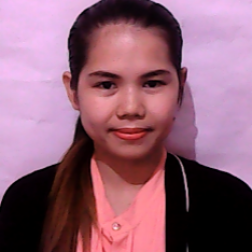 A certified Teacher of English to Speaker of Other Languages (TESOL) and a certified Teacher of English to Young Learners (TEYL). She is also an experienced call center agent for the U.S.A company. She had been teaching English to Korean and Chinese nationalities. She can speak basic Nihonggo and was able to guide some Japanese abroad for business purposes. Being a teacher of the English language to foreign people has always been her dream job. She'll be best suited for beginners and intermediate level students. I had a very good time. I was very glad to hear you that I was the first student for you. Thank you for your lesson!